Jean Taggart passed away in October 2002 after a long and valiant battle with breast cancer. Everyone who knew her even slightly admired her strength and bravery throughout her final ordeal; equally valued was the untiring support of Tim, her husband of twenty years. Jean burst upon the needlework scene just as soon as she finished her Valentine Certification in 1985. 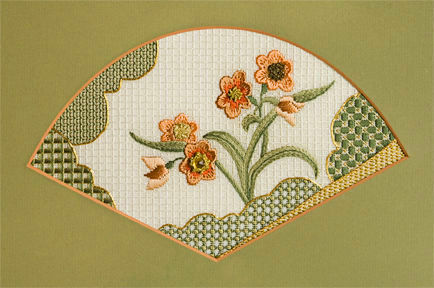 Upon completion of Level II Jean’s lovely Asian design, Narcissus Fan, was chosen for inclusion in Valentine’s permanent collection. Shortly after graduation Jean was picked up for her first national seminar by ANG; Her highly regarded View from Anastasia’s Window was enthusiastically greeted by eager students across the country. Successive years produced a number of wonderful designs which took Jean to seminar after seminar and chapter after chapter for years on end. Her designs were always elegant and refined, based on solid research and inspired by cultures worldwide. A study of Southwestern art brought forth Pueblo Patterns, delving into Indian design she produced Mogul Medallion. She researched Irish illuminated manuscripts and gave the stitching world Gaelic Gold. Among her most popular and memorable designs were the series of four Japanese geishas, representing the four seasons and introducing embroiderers to beaded pulled thread work. In addition to her fabulous designs Jean’s stitching was impeccable. She favored the finest of threads, mostly silks and the shiniest metal threads. Her shaded flowers were rendered with the most superior technique, transcendent long and short stitch the rest of us can only hope to imitate. Not content in just teaching, which she really loved the most, Jean also authored two needlework books, Laid Fillings for Evenweave Fabrics and Darning Patterns for Evenweave Fabrics. For years she also did the charts for all the designs in Needle Pointers. In addition to her illustrious career in the needlearts, Jean’s personality truly shone. She was so intelligent, prodigiously well read, well informed, and blessed with an iron clad memory. Indeed I believe Jean knew something about everything, and if a question arose she could extrapolate from her voluminous knowledge and usually come up with the correct answer. She loved word games, devised the most outrageous puns, and relayed positively wicked but subtle jokes. To know her was to laugh — a lot. And yet the outward demeanor was one of a very disciplined person, quiet and refined, careful in her appearance, never a hair out of place, maybe even a little prim. She had such high standards for herself that she carried her students and candidates along with her. Her service to NAN was long and noble. Immediately upon finishing certification she served as a counselor; later she was asked to be Assistant Director of Certification. Of course, that is followed by a term as Director of Teacher Certification and another as Director of Education, the top NAN office. Like other directors before her Jean then resumed counselor duties, until she was asked again to fill out another term as Director of Teacher Certification. She accepted with alacrity, even though she was battling her cancer, and went on to also serve as Director of Education, the office she held at her death. The needlework world is much the poorer for the loss of Jean Taggart. She has enriched our lives with enchanting designs, the most beautiful stitching, avid mentoring of aspiring teachers, and gracious and generous teaching in the classroom.